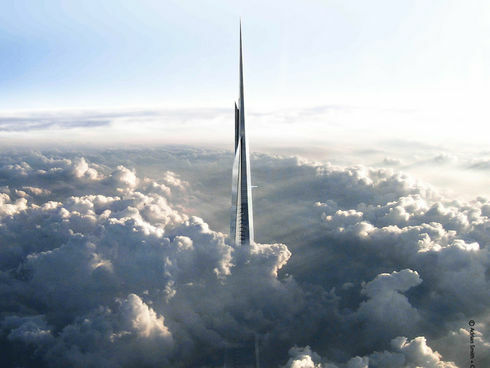 Having recently reached a height of 113 meters, the contender for the title of the world’s tallest building is slowly growing up in Jeddah, Saudi Arabia. Only time will tell whether the Jeddah Tower, formerly known as the Kingdom Tower, will reach its design height of more than 1 kilometer. If it does, it will be at least 172 m taller than the current record-holder, the 828-m Burj Khalifa in Dubai. Adrian Smith + Gordon Gill Architecture designed the 465,000-sq-m, tapered megatower with three wings. The building, with a shear-wall concrete core, has no columns. Instead, throughout each floor plate, there is a series of 85-MPa reinforced-concrete walls, interconnected by link beams, according to the structure’s designer, Thornton Tomasetti. 1990-luvulla tapasin sekä Smithin että Thortonin. Edellinen oli jo maailmankuulu Shanghain Jin Mao rakennuksesta (420.5m/1999) ja jälkimmäinen Kuala Lumpurin Petronas Towers tuplatorneista (451.9m/1996) mailman korkein rakennus 1996-2004. Jeddah Toweriin tulee KONEn hissit. Hiilikuituiset köydet nostavat hissin kertaheitolla 638m korkeudella olevalle näköalaterassille. ThyssenKrupp painaa kuitenkin päälle. Sen magneettilevitaatioon perustuva hissijuna voi nousta kuinka korkealle tahansa, ja voi siirtyä myös vaakasuoraan. Tästä löytyvät kiintoisat Engineering News-Recordin jutut.